Despite the global warming you hear about, polar bears are making a comeback. Most polar bear communities are already declining. Melting ice is the greatest threat to their future. Polar bears are found in the Arctic Circle and surrounding land masses. There are 19 recognized subpopulations, and estimates place their numbers at about 20,000 to 25,000. Polar bears are classed as vulnerable by the World Conservation Union (IUCN) and listed as a threatened species under the U.S. Endangered Species Act. Yet some claim that polar bear numbers have increased since the 1950s and are now stable. So what is the situation for this species? • Nobody really knows how many bears there were in the 1950s and 1960s. Estimates then were based on anecdotal evidence provided by hunters or explorers and not by scientific surveys. • Polar bears are affected by several factors, including hunting, pollution and oil extraction. Most notably, hunting, particularly following the introduction of snowmobiles, airplanes and ice breakers, led to a huge decline in certain subpopulations. The introduction of the International Agreement on the Conservation of Polar Bears in 1973, which restricted or even banned hunting in some circumstances, consequently resulted in an increase in polar bear numbers. • Not all subpopulations are affected to the same degree by climate change, and while some subpopulations are well studied, for others there is insufficient data to make broad statements about current and past numbers. With this caveat in mind, what do the figures actually say? According to a 2009 report by the IUCN/SSC Polar Bear Specialist Group, of the 19 recognized subpopulations of polar bears, eight are in decline, one is increasing, three are stable and seven don’t have enough data to draw any conclusions. Figure 1 below compares the data for 2005 and 2009. 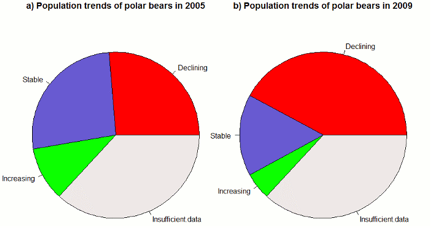 Figure 1: Subpopulation status of polar bears for 2005 and 2009 (Data source: Polar Bear Specialist Group) © John Cook. • The early retreat of summer sea ice means that bears have less time to hunt and therefore less time to build up fat reserves. • The fragmentation and reduction in sea ice has several impacts. It forces the bears to swim longer distances, using up some of their fat reserves. It also reduces the number of seals, which are the bears’ main source of food, and impedes traveling and den making. And it also forces the bears to spend more time on land, with increased interactions with humans, potentially leading to higher mortality. To get an idea of the potential impacts of future climate change on polar bears, we can look at subpopulations found at the bears’ southern range, where habitat changes have been most noticeable so far. A good example is the western Hudson Bay subpopulation, which is one of the best studied. Here, ice floe breakup is taking place earlier than it did 30 years ago, effectively reducing the feeding period by about three weeks. As a result, the average weight of female polar bears has dropped by about 21% between 1980 and 2004, and the population declined by 22% between 1987 and 2004. In Alaska, there is evidence of increased cub mortality caused by a decline in sea ice.